Kyle Sims is one of today's most talented wildlife artists. 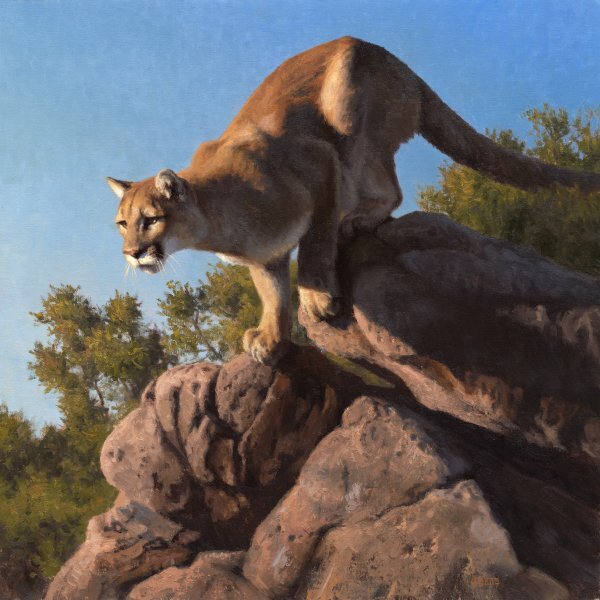 This new release is a close encounter with one of nature's most beautiful animals, the mountain lion. The creature's stealth moves make him one of the most able of hunters. In this remarkable image, the big cat stalks his prey from his lofty view on several large boulders. At just the right moment, the cat will leap through the air to capture his unsuspecting quarry. "Spring Loaded" was awarded Best in Show at the 2009 Buffalo Bill Art Show and Sale.